For years now Geroge Clooney has been attempting to reinvigorate the genre that has kind of graciously been labeled "movies for grown-ups" with the likes of Michael Clayton, Up in the Air, The American, The Ides of March, The Descendants, and even The Monuments Men. Sure, he's thrown in a few guarantees like Gravity and the what seemed to be a home run in Tomorrowland, but he largely likes to star in, produce, and direct films made explicitly for the more mature crowds. With the release of a new Hail, Caesar! trailer yesterday and the films February fifth release date looming it is no wonder we now have a trailer for Clooney's other offering this year. Re-teaming with Oceans Eleven co-star Julia Roberts (who's been doing her part for grown-up movies as well with last years average, but still underrated Secret in Their Eyes) the two have taken the leads in the latest directorial effort from Jodie Foster (yeah, this thing would have been huge in '96). The film follows Clooney's Lee Gates, a TV personality whose insider tips have made him the money guru of Wall Street. Things get tricky when Kyle (Jack O'Connell of Unbroken) holds Lee and his entire show hostage on air threatening to kill Lee if he does not get the stock up 24 and a half points before the bell. Naturally, Lee's ratings soar as the entire country tunes into the media frenzy while at the same time shedding light on a possible scandal involving the company in question. The story is timely, the performers are top notch, and Foster while coming off a rather shaky previous feature has done enough work in TV lately that having her at the helm inspires more confidence than doubt. Needless to say that while the trailer doesn't do much for me stylistically there is too much promise to not be excited. 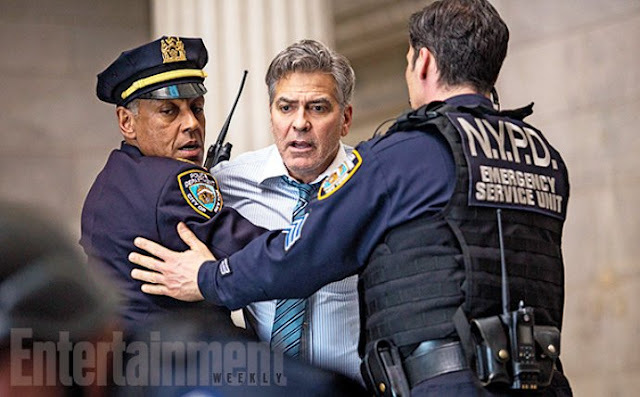 Money Monster also stars Giancarlo Esposito, Dominic West, Jack O'Connell, Caitriona Balfe, Greta Lee, Emily Meade, Chris Bauer, Condola Rashad, Olivia Luccardi, and opens on May 13, 2016. Synopsis: In the taut and tense thriller Money Monster, Lee Gates (George Clooney) is a bombastic TV personality whose popular financial network show has made him the money wiz of Wall Street. But after he hawks a high tech stock that mysteriously crashes, an irate investor (Jack O'Connell) takes Gates, his crew, and his ace producer Patty Fenn (Julia Roberts) hostage live on air. Unfolding in real time, Gates and Fenn must find a way to keep themselves alive while simultaneously uncovering the truth behind a tangle of big money lies.